This Celtic stained glass suncatcher features shamrocks along with the word Ireland and is enhanced with an intricate knot-work motif. 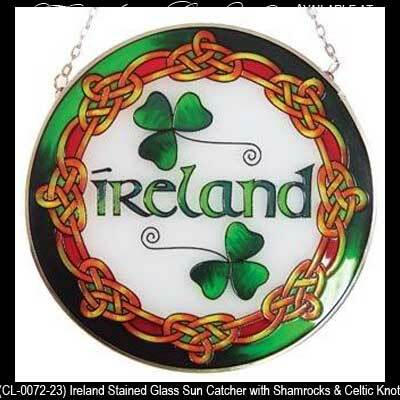 The Irish suncatcher measures 6 1/4” round and is constructed of glass with a metal rim along with a metal chain for hanging. The stained glass Irish suncatcher is ready to hang in your window and it is gift boxed with Celtic knot and shamrock history cards that are complements of The Irish Gift House. This stained glass shamrock design is made in Ireland by Clara.